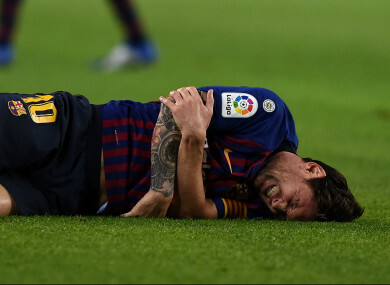 LIONEL MESSI WAS replaced in the first half of Barcelona’s LaLiga match against Sevilla with a concerning arm injury, placing his Clasico participation next weekend in doubt. He was given medical attention for several minutes on the touchline, with Barca’s physios putting a significant amount of strapping around his right elbow. It could be a particularly crucial injury given the importance of Barca’s upcoming games against Inter in the Champions League and Sunday’s El Clasico clash with Real Madrid. Messi is Barca’s top scorer so far this season, with his first-half effort against Sevilla his seventh in nine LaLiga outings. Philippe Coutinho scored Barcelona’s first in the second minute and they led 2-0 at the break. Luis Suarez converted a penalty 18 minutes into the second period to leave the hosts three in front. In an eventful final 11 minutes, Pablo Sarabia got Sevilla off the mark before Ivan Rakitic made the game safe for Barcelona will a goal of his own. In stoppage-time, Luis Muriel made it 4-2 for Sevilla. Email “Barca concern ahead of Clasico as Messi injured in win over Sevilla”. Feedback on “Barca concern ahead of Clasico as Messi injured in win over Sevilla”.